BOGO (Buy 1 and get 1 free!) All August: Bernat Pop!, Patons Peak, Premier Aurora & Sweet Roll, Bernat Baby Coordinates. This past month, we’ve had several exciting new yarns come into the shop! 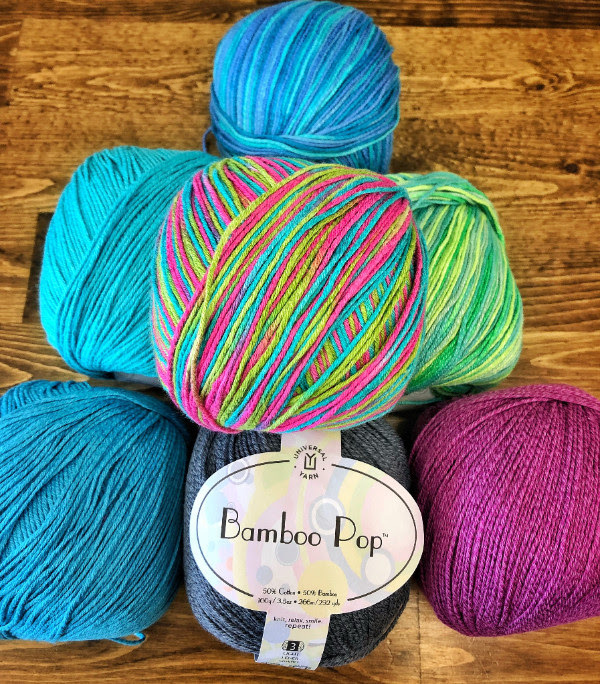 – Universal Yarns Bamboo Pop – 3 variegated and 4 solids in 100g balls with 292yds of 50% cotton/ 50% bamboo blend in a Sport weight. So soft and fun! We’ll be getting more colours of these in! – Red Heart Scrubby Smoothie – 6 variegated craft cottons that match Red Heart’s Scrubby yarns! Super fun, bright colours in 85g balls so you can make items to match the scrubbies you make! – Schachemayr’s Regia Sock yarns! We’ve brought in 4 colours of their Pairfect Design Line (a 100g Superwash wool sock yarn) and 4 colours of the Pairfect Kids Colors (a 60g superwash wool sock yarn). These amazing things make a perfectly patterned pair every time with the help of an ingenious yellow starting section to both socks! Come in and check them out!. – Schhachenmayr’s Regia Baby Smiles – a tiny 25g ball of superwash sock wool so that nothing is wasted when you make baby socks! Currently, only the pink pattern came in, but we’ll be getting more soon…they’re so cute! – Diamond Luxury Baby Alpaca Sport – This is actually a bulky yarn (5) in a super duper soft baby alpaca, in 100g (100meters) hanks. Currently available in blue only, but soooo, so soft! – Phentex Slipper & Craft Yarn – Yes! We finally brought in 6 colours for you because enough people requested it. This is a hard-wearing 100% Olefin yarn in 85g (164 yds) balls, perfect for making tough slippers and slipper soles. We’ve received plenty of new colours for a few existing yarns and have restocked our Ancient Arts and Black Cat hand dyed yarns…come in and check them all out! Troubleshooting Tuesdays and all regular knitting classes have been suspended until the fall, since I know you folks are all so busy with Summer and vacations! You can still come on in for help, and I will do everything in my power to help you fix or sort out any problems you may have with your knitting. If you want a private lesson for knitting, it can be arranged with prior notice, just call the shop or come on in! Summer projects are small projects!!! Small projects are prefect for taking traveling or on vacations. They don’t take up much space or yarn, and aren’t hot on your lap when it’s roasting outside! They also work up satisfyingly fast (admittedly my favorite part!) I love, love, love small projects! Here’s a few of the free ones on Ravelry that caught my eye, and I’m sure I’ll try a few in the next while. How about you?? Sugar n Cream Dishcloth by Diana Lee – a staple knit in a corner to corner dishcloth – who doesn’t love getting gifted dishcloths?! Woven Dish Cloth by Carrie Fleming – a change from the standard dishcloth, a pretty knit woven-look cloth. French Market Bag by Alexandra Tavel – Crocheted in worsted weight cotton, these are quick, fantastic bags to move towards plastic-bag-free shopping! The Landry Slouchy by Twisted Arrow Designs – a crochet beanie in a classic slouchy style and Aran weight yarn. A quick project for gifting or wearing! 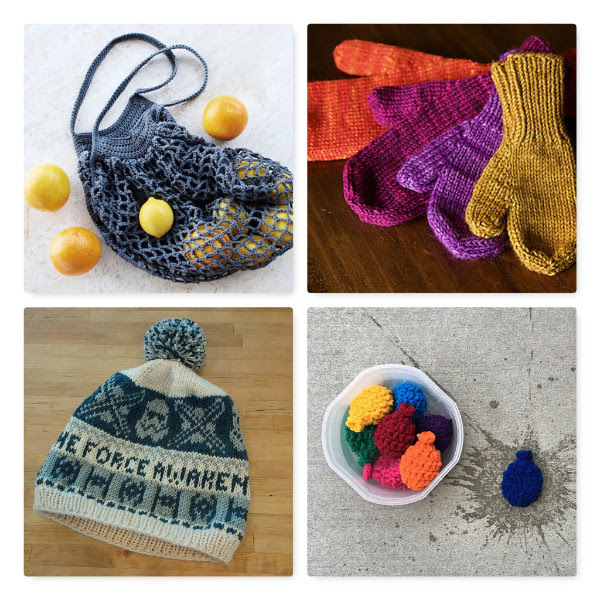 The World’s Simplest Mittens by Tin Can Knits – another fabulous free knit pattern by Tin Can Knits (there are so many!). This multi-sized pattern would work up so fantastically in either our Patons Classic Wool DK or in our Black Cat or Ancient Arts hand dyed yarn for fun, warm hands this winter! Rose City Rollers by Mara Catherine Bryner – an easy, shortie, rolled cuff sock for summer knitting and wearing! We have tons of sock yarns and even hand-dyed sock yarns that would be amazing for these socks. So many patterns are available for free! Be sure to search on Ravelry or your favorite pattern archive for more awesome summer projects.